To edit a component, you select Edit in the component’s title bar in Studio. If you have more than one enrollment track in your course, or if you have enabled cohorts, you can limit a component’s availability to specific groups of learners. 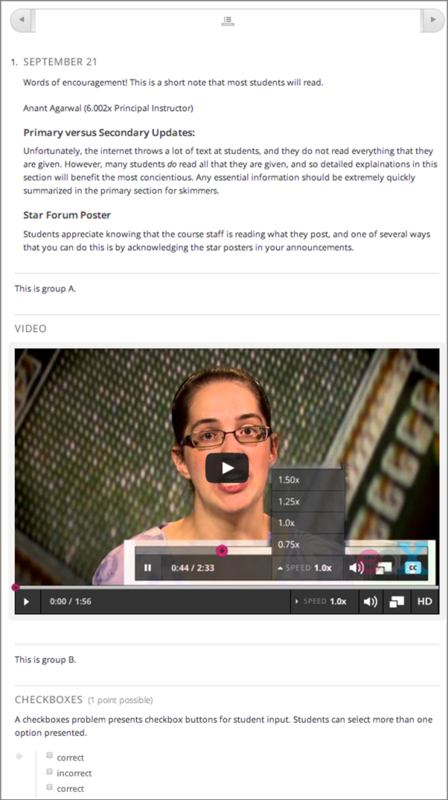 For information about offering different content to different learner groups, see Offering Different Content to Different Learner Groups. Components inherit any group access restrictions that are set for their parent unit. If you set additional group access restrictions for a component, make sure the component access settings do not contradict the unit access settings. 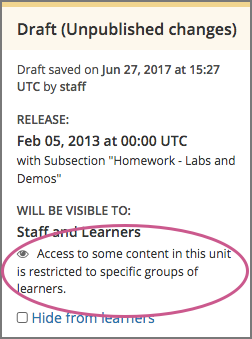 For example, you cannot give Group A of learners access to a component if Group A does not have access to the unit that contains the component. To specify a component’s access settings, follow these steps. On a unit page, for each component for which you want to restrict access to, select the Access Settings icon. 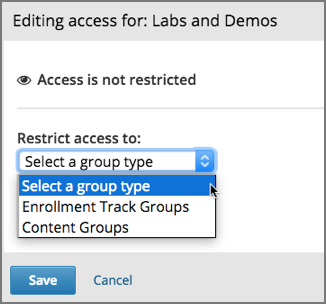 In the Editing access dialog box, for the Restrict access to option, select the group type by which you want to restrict access. After you have selected a group type, you see a list of the groups that exist for that group type. 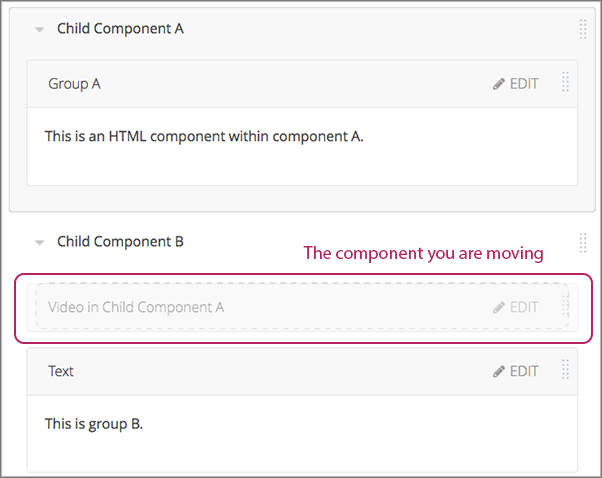 Select the checkbox for each group for which you want the current component to be available. 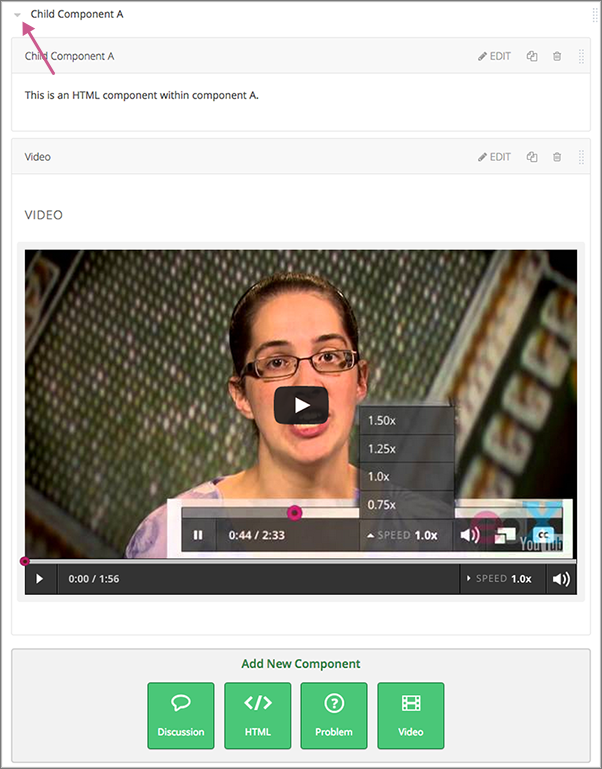 The groups which have access to the component are listed under the component title in the Studio course outline. 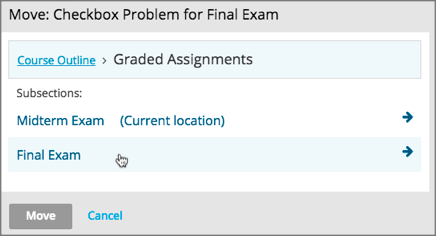 In addition, on the unit page in Studio, a message in the publishing status bar indicates that some content in the unit is restricted to specific groups of learners.